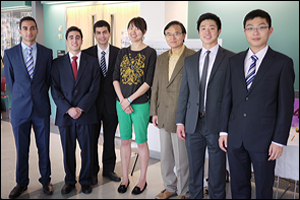 Members of the BioE Class of 2013 with their mentors, BioE faculty, and Capstone judges. 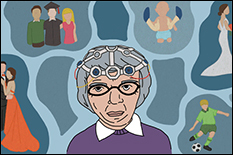 What does the future hold for human healthcare? Fischell Department of Bioengineering (BioE) seniors exhibited their ideas–including devices meant to ensure safer stays and more effective recoveries for patients in intensive care units, better diagnostics for eye and skin conditions, improved surgical tools, a calibration system for radiation therapy, and a baby mattress capable of combating sudden infant death syndrome–at the Capstone II finale, held in May 2013. 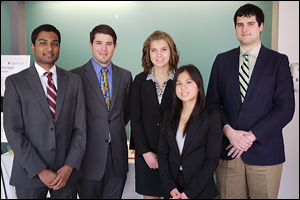 In Capstone, teams of students create their own engineering designs from concept to product, while also learning about market research, the patent process, business plans and ethics. 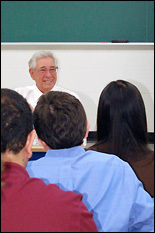 BioE teams are typically matched with a pair of advisors including a member of the BioE faculty and a physician, engineer, or researcher from a regional hospital, business, university, or national laboratory. 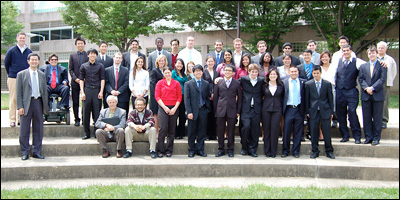 Kaiming Ye, the National Science Foundation's Biomedical Engineering Program Director. Intensive care unit (ICU) patients are often placed on mechanical ventilation support that assists or replaces their ability to breathe. Unfortunately, this life-saving tool increases the risk of lung infections, and because patients are also often sedated, the symptoms of infection are more difficult to detect. ICU staff monitors patient lung health using a catheter called a mini-bronchoalveolar lavage (mini-BAL) to collect fluid samples, which are then sent to the lab for analysis. The mini-BAL's tip direction or angle cannot be controlled, there is no way to confirm tip placement at the desired sample location, and the procedure is uncomfortable for the patient. 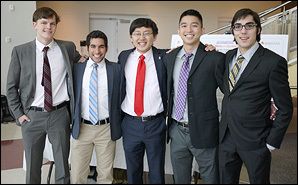 Team 1 focused on improving the mini-BAL by incorporating Nitinol, a shape-memory alloy whose deformation can be predictably controlled by temperature, into its design. A Nitinol guide wire allows the mini-BAL's operator to gently bend its catheter to the required angle when it reaches the end of the trachea: 20° to enter the right lung and at least 35° to enter the left. The Nitinol's fast response time and adaptability, says Team 1, should make the mini-BAL a more flexible, stable and comfortable tool, particularly if coupled with a CORTRAK system, a device currently used to visually guide the insertion of feeding tubes. A stay in the ICU may save your life, but it comes with its own risks, including ICU-acquired weakness, the result of being sedated or immobile for long periods of time. Research has shown that resuming activity early in recovery, even something as simple as sitting up, helps stimulate muscle function. 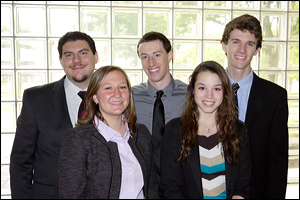 Team 2's goal was to create a safe, passive exercise device for ICU patients that would promote early mobilization. The group's invention, a combination of bed and lounge chair, is preprogrammed to move the body into different positions and angles optimized for specific activities (resting, eating, physical therapy) or designed to promote strength in particular muscle groups (core, legs). 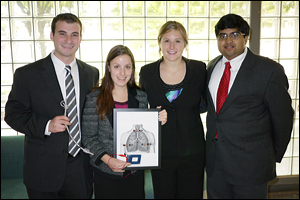 Team 3 created a large-scale model of a novel, multi-sectioned pulmonary balloon dilator, a device used to open up a patient's airway to correct stenosis (dangerous, abnormal narrowing) or prevent restenosis. 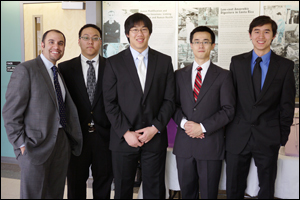 Their prototype demonstrated how it could allow a pulmonologist to select the best balloon size for the patient's condition while also improving visualization of the airway. The dilator was designed as a single device with three independently-inflatable sections to give the pulmonologist more immediate opportunities to make adjustments instead of having to reinsert a different catheter loaded with a different balloon. 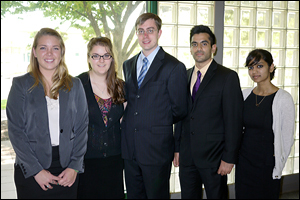 Like Team 2, Team 4 also hoped to address the need for early mobility of ICU patients to prevent muscle atrophy. The team chose to focus on the activity of rising from a sitting to a standing position, a basic functional movement that becomes increasingly difficult with the loss of skeletal muscle strength. Current devices designed to help patients stand up are often bulky, heavy and expensive, but without one, multiple caretakers are required to safely lift a patient to his or her feet. 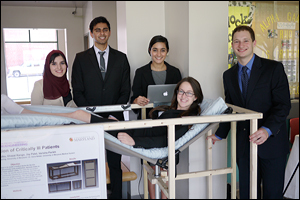 Team 4's patent-pending device is lightweight and designed to be set up by a single person in a typical ICU room. It is capable of handling patients ranging from the petite to the very tall or very heavy (exceeding 6 feet in height and up to approximately 600 pounds). Patients suffering from lung cancer often experience obstructions in their central airways. In order to enable them to breathe, surgeons may implant a silicone stent (tube) in the affected area of the trachea or lungs. This solution greatly improves the patients' quality of life, but over time the stents themselves may become obstructed with a buildup of tissue or mucous. Currently, there is no way to monitor the stent—patients must return to the hospital if problems occur, and may require a second surgery to replace the stent. Team 5 developed a sensor that would be incorporated into a stent and is capable of detecting the buildup. The sensor routinely transmits data to a smartphone application, tracking accumulation over time and allowing doctors to detect problems before they become emergencies. Patients in respiratory distress or under general anesthesia require intubation, the insertion of an endotracheal tube that ensures a clear path for air to reach the lungs. Millions of intubations are performed each year, and all require one or more x-rays to ensure correct placement of the tube and to monitor for displacement. 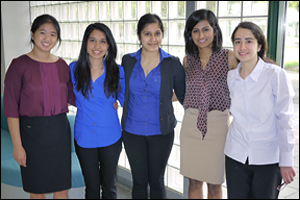 Team 6's goal was to create "a novel, portable and inexpensive device to continuously and non-invasively monitor endotracheal tube position." Their design incorporates a radio frequency identification (RFID) tag that emits a signal, which is received by an external device. Signal processing software, which takes natural chest motion into account, calculates the change in distance the signal has traveled over time. If the tube has moved more than 2cm from its original position, an alarm alerts hospital staff. The team, which has filed a provisional patent on its device, says that because the idea could be applied to many other medical devices that rely on correct positioning, it could have a substantial, far-reaching impact on patient care. 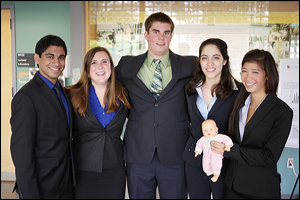 Team 7 wants to provide parents with an easy-to-use, affordable, home care device capable of preventing the sudden infant death syndrome (SIDS). Their prototype takes the form of a pad placed in the baby's crib and an external monitoring device. The pad contains sensors, activated by the baby's weight, that are capable of detecting the motion created by the infant's breathing. It transmits this data wirelessly to the external monitor, which interprets it as a breath rate. If the baby stops breathing, the fluctuating signals stop. If the established breath rate does not resume after a brief series of checks (to prevent false alarms), the pad will vibrate to wake the baby, which often stimulates breathing. At the same time, the monitor's alarm will sound, calling parents or caretakers to the room. When a tooth decays, it begins with a bacterial infection that makes its way toward the interior pulp. As the infection advances, the tooth's natural defenses engage, creating an inflammatory response known as a periapical lesion at the root of the tooth. A root canal or oral surgery to remove the tooth may be required to resolve the problem. Computed tomography (CT) scans are sometimes used to assess the extent of the lesion, but is not entirely accurate. 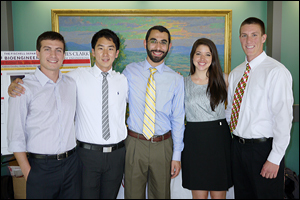 Team 8's objective was to design software capable of quickly translating CT data into accurate 3D representations of periapical lesions, so dentists and oral surgeons can gauge the severity of the problem and provide the best treatment option. The team's novel algorithm successfully compiled CT images into models, and calculated the volume and maximum areas and diameters (along multiple axis) of real and simulated lesions. Hand-held and mounted ophthamoloscopes are used to diagnose and evaluate retinal detachment, diabetes mellitus, glaucoma, and other conditions, but they can be difficult to align and focus, have limited field-of-view and depth perception, and cannot capture images of the patient's retina for future reference. Team 9 designed a portable, headgear-mounted system with advanced lenses and digital camera. The team demonstrated that its system was capable of accurate alignment, illumination and focus, and could capture images on both flat planes and curved surfaces at a wider angle than a standard ophthamoloscope. 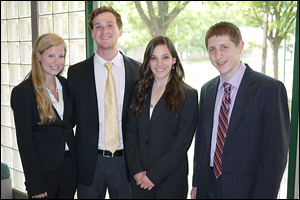 Team 10 also tackled the challenge of providing doctors with better ways to examine the retina—located on the fundus of the eye, the area opposite its opening, the pupil—and provide quality images that can be referred to or compared to prior results. The ophthamoloscope, the handheld device doctors use to look into a patient's eye, does not provide a view of the entire fundus, and has not changed much since its invention in 1851. Team 10's goal was to give this common tool a better field of view and realtime imaging and video capabilities, and make dilation of the patient's pupil unnecessary. Their all-new device design uses an entirely different system of lighting and lenses to capture detailed images of the optic disc and the blood vessels emerging from it. The team also designed the model eye used to test the device. Resectoscopes are surgical devices used to remove uterine fibroids and tumors. Depending on the size and location of the growths, a surgeon may need to use additional tools to cut them into smaller pieces, and/or cauterize the area from which they were removed to prevent bleeding. Surgeons often have difficulty maintaining a clear visual of the affected area when cutting causes tissue particles to cloud the uterine cavity. Removing these particles requires swapping, reinserting and repositioning tools, which adds time to an already uncomfortable procedure. Team 11's goal was to make tumor and fibroid removal easier for doctors and patients by enabling the surgeon to cut, clear and cauterize using a single device. Tests performed on a bovine kidney with fibroids demonstrated the prototype's speed, ability to section a fibroid into pieces small enough for removal, and ability to work safely around veins and arteries. Skin problems are common, and vary in severity from a simple rashes to cancerous lesions. Most people visit their primary care physicians first, either out of habit or because they cannot see a specialist without a referral, but research has revealed that dermatologists are 41% more accurate in their diagnoses. 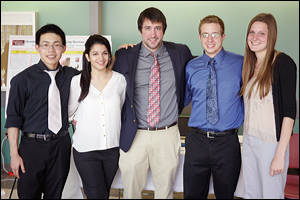 Team 12's goal was to design a device primary care physicians can use to increase the accuracy of diagnoses of skin problems in their offices. Their solution consists of two components. The first is a modified digital camera used to capture images of skin under consistent conditions. The second is machine vision software that processes the images, then analyzes the skin problems in them using the "ABCD method" of detecting cancerous lesions: It is able to recognize Asymmetry, irregular Borders, uneven Color, and Diameters greater than 6mm. 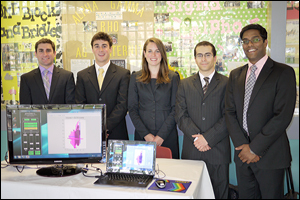 Team 13 sought to create a portable electrodiagnostic tool for the early detection of carpal tunnel syndrome (CTS). A combination of workplace screening and early intervention, they say, is the key to saving U.S. businesses and their employees billions of dollars in medical bills, leave, and the loss of productivity. The team's device uses an electromyogram (EMG) to detect differences in voltage across the median nerve between the forearm and wrist, which could indicate the onset of CTS: while a there will be no change in voltage in a healthy nerve while the arm is at rest, the nerve affected by a carpal tunnel injury will send signals into the surrounding muscle. The system is also capable of performing a motor nerve test (called a nerve conduction study) on the patient by measuring stimulation sent along the median nerve and its responses. 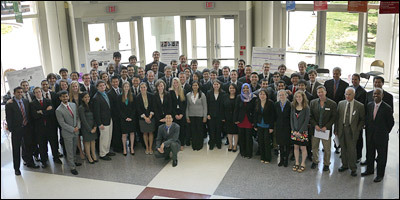 The team's corresponding software, which runs on Android-based devices, displays and analyzes the signal data received. One of the ongoing challenges in the treatment of cancer is limiting the amount of radiation that passes through healthy tissue on its way to a tumor. A new device called the Gammapod, produced by Xcision Medical Systems, LLC, is specifically designed for the treatment of breast cancer. Its unique structure provides site-specific access to the breast without substantially affecting surrounding healthy tissue. Team 14 worked with Xcision to create a calibration system for the Gammapod that would meet the strict calibration standards required of all radiation treatment equipment. The team developed quality assurance software that compares a target treatment program (a phantom set of images) to measured treatment from the machine, comparing location, dosage intensity, and geometry. The interface uses color coding to represent differences, and can self-adjust for shifts. The data provided indicate what adjustments must be made to calibrate the Gammapod. 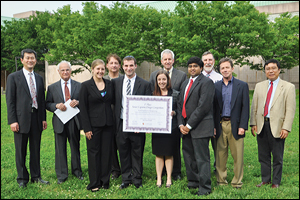 Patent position under review. We'll provide more information as soon as we are able. 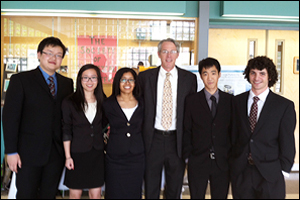 Our First Place team, Team 6 (System for Monitoring Endotracheal Tubes with RFID Technology) with their mentors and the judges. Good Luck, Class of 2013! We wish all of the Class of 2013 the best! We're sure innovative engineers like these will succeed wherever they go. Our seniors would like to thank their professors and mentors (listed with their Capstone teams above); lab staff including Melvin Hill and Gary Seibel for guidance, time, and labor; administrative staff members for help with financial support and purchasing; Professors Yang Tao and William E. Bentley; our 2013 judges; and friends in outside academia and industry for the advice and supplies they donated that helped these projects succeed.